Call us on 0115 940 5550 for more information. Clevertouch have combined superior connectivity, innovative software, and a simple user interface to create their most enhanced model yet. Clevertouch screens feature a dual-platform interface and a cross-platform connectivity structure,allowing complete collaboration. Clevertouch has none of the disadvantages of projectors: no obscuring shadows and no issues with bright light. The entire range showcases beautiful screens and simple controls. 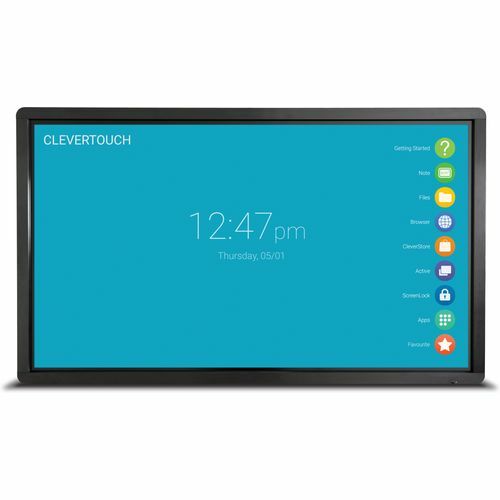 An all metal frame, 4mm safety glass, and a 5 year de-install/re-install warranty guarantees your Clevertouch will be enhancing users lives for many years. Corporate and higher education users should choose the Pro Android module, complete with 2x Clevershare (UK only) Lynx, LynxPro, LynxPro Meeting and Montage Lite. Add a slot-in Windows 10 Pro PC i5 or i7 to avoid messy wires and complicated set up.